The information provided on the Scientific Papers. Series B. Horticulture Journal’s website by the authors, such as names and email addresses will be used exclusively for the stated purposes of this journal and will not be made available for any other purpose or to any other party. "Scientific Papers. Series B. Horticulture" is an open access journal that does not charge readers or their institutions for access. All research articles published in "Scientific Papers. Series B. Horticulture" in full text are immediately freely available to read, download, copy, distribute, print, search, link and share. "Scientific Papers. Series B. Horticulture" currently does NOT receive any revenue from selling subscriptions for online view or print, defraying its editorial and production costs by funding article processing charges (APCs) from article publishing fees and from University of Agricultural Sciences and Veterinary Medicine Bucharest’s own funds. Within the "Scientific Papers. Series B. Horticulture" there are analysed potential cases of plagiarism on their own merits. The Journal's Editorial Board uses an anti-plagiarism software system, to check the articles received for publishing, called Plagiarism Checker X. The "Scientific Papers. 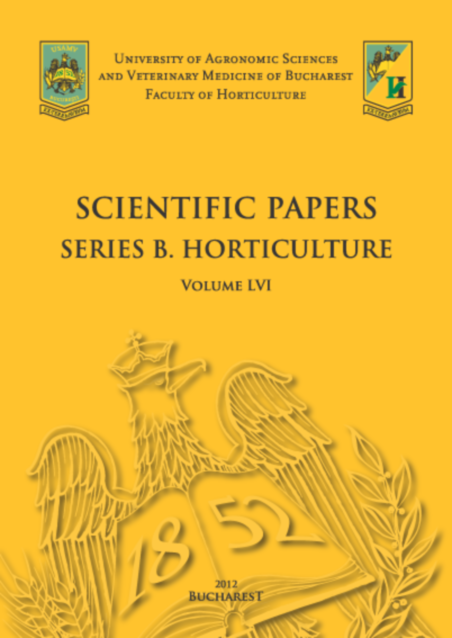 Series B. Horticulture" is an international scientific journal published by the Faculty of Horticulture, University of Agronomic Sciences and Veterinary Medicine of Bucharest. First number of the journal appeared in 1957 as scientific publication of Faculty of Horticulture Bucharest from "Balcescu" Agronomic Institute. Since then, the journal published annually without interruption, registering a high scientifically level. From 2002 to 2011, the journal "Lucrari stiintifice, seria B, Horticultura" (ISSN 1222-5312) was edited in electronic version (CD-ROM) and the content have been entirely published in English. The horticulture journal contains the scientific papers of the Romanian and abroad researchers that attend at the Annual Horticulture Faculty Symposium. Before 2012, the works have been divided into domains, also grouped in chapters such us Vegetable growing, Ornamental Plants, Landscape architecture, Fruit growing & Technology, Viticulture & Oenology, Botany & Physiology, Other fields. In 2012 and 2013 the old chapters have been enclosed in 5 topics: Sustainable products and technologies in horticulture, Horticultural biodiversity and genetic resources, Plant production systems, Ornamental plants, design and landscape architecture, Miscellaneous. Thanks to the major contributions of the high competence and experienced members of the scientific committee, the journal has a wide circulation and recognition among specialists in the country and abroad.